Volunteer stream monitoring helps collect important environmental data that the County uses to monitor long-term trends of our streams. The Office of Sustainability and Environmental Management coordinates the Volunteer Stream Monitoring Program. 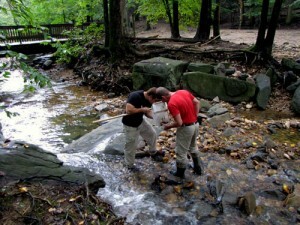 After participating in County-sponsored training, stream monitors wade into Arlington’s streams and report back important environmental data that we use to monitor long-term trends of our streams. The resident-collected data is also reported to the state as a part of our municipal separate storm sewer system (MS4) permit. Macroinvertebrates are small organisms that live underwater in our streams, lack a backbone, and can be seen with the naked eye. These “stream bugs” live a portion of their life cycle in the streams and depend on them for habitat and food. Some macroinvertebrates are more tolerant of stream pollution than others, which makes them good indicators of water quality. Macroinvertebrate monitoring is also helpful to compare a stream’s health before and after pollution prevention practices are enacted. If a stream has more types of pollution-sensitive bugs present than before, this indicates the stream’s health has improved. Since 2005, volunteers have been collecting water samples and testing them for E. coli on a monthly basis. The program was developed to identify areas with high bacteria levels and to help identify potential sources of bacteria. We collect the data and provide them to the Virginia Department of Environmental Quality as a section of our MS4 permit report. There is one bacteria monitoring site on Doctor's Branch. More than 80 percent of Doctor’s Branch was found to be in stabilizing condition. Learn more about Doctor's Branch. Donaldson Run drains directly into the Potomac River. It ranks as one of the “least impacted” watersheds in the County. Aquatic worms, black flies, net-spinning caddisflies and small minnow mayflies are commonly found here. Learn more about Donaldson Run. 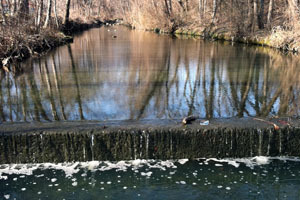 Four Mile Run is the largest stream flowing through Arlington, draining approximately two-thirds of the County. It flows through residential areas as well as urban corridors in south Arlington. There are three macroinvertebrate monitoring sites and 10 bacteria monitoring sites on Four Mile Run. Damselflies, flatworms, midges, net-spinning caddisflies and small minnow mayflies are common. Learn more about Four Mile Run. 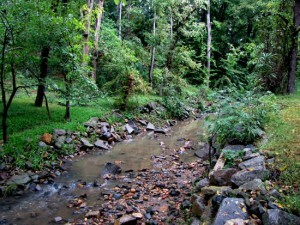 Gulf Branch is located in north Arlington and drains directly into the Potomac River. Gulf Branch is classified as one of the “least impacted” watersheds in the County. It's the home of black flies, flatworms, midges, net-spinning caddisflies and small minnow mayflies. Learn more about Gulf Branch. 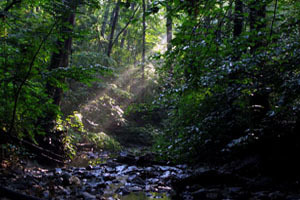 The Little Pimmit Run watershed drains to Pimmit Run in Fairfax to the north and then to the Potomac River. The commonly found macroinvertebrates are tolerant of pollution and include aquatic worms, amphipods, black flies, flatworks, midges, net-spinning caddisflies and small minnow mayflies. Learn more about Little Pimmit Run. There is one bacteria monitoring site on Lower Long Branch. 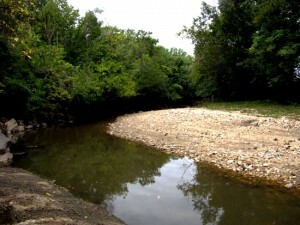 More than 60 percent of Lower Long Branch was found to stabilizing and more than 80 percent of the stream partially or fully stabilized. Learn more about Lower Long Branch. 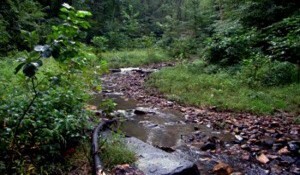 The Lubber Run watershed drains into the upper main steam of Four Mile Run. Aquatic worms, flatworms, midges, net-spinning caddisflies and small minnow mayflies are common. Learn more about Lubber Run. 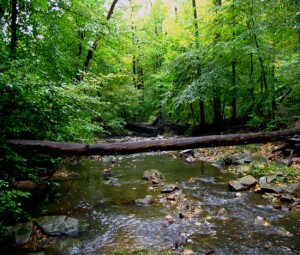 More than 80 percent of the Upper Long Branch watershed is located outside of Arlington. One-third of the stream channel is within the County. 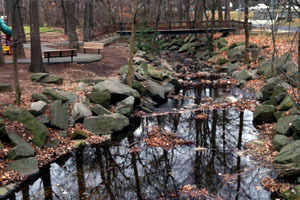 Upper Long Branch drains into the middle main stem of Four Mile Run. Midges, net-spinning caddisflies and small minnow mayflies are common across Four Mile Run sites. Learn more about Upper Long Branch. 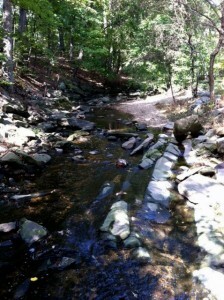 The Windy Run watershed drains directly into the Potomac River. Commonly found macroinvertebrates in Windy Run include black flies, fingernet caddisflies, midges, net-spinning caddisflies, small minnow mayflies and snails. Photo courtesy of Stu Searles. Learn more about Windy Run.